Hi, I am interested in your 1979 Pontiac Firebird (stock #1738-TPA) listed on Autotrader for $29,995. I'd like to get more information about this vehicle and confirm its availability. 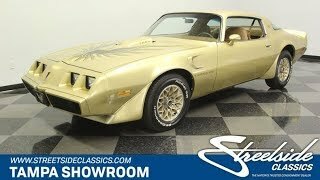 There was just something a bit meaner about the restyled 1979 Pontiac Firebird Trans Am. So when you can find an actual miles example that has remained in the same family all its life, then this special loaded and sleek V8 coupe has an instant attraction. Theres something very distinctive about the factory-correct Solar Gold. It created one of the coolest coordinating packages around when combined with the darker gold hood bird and golden snowflake alloy wheels. So it was sort of like a custom car straight from the factory. This one amps up the appeal because its a two-owner machine that has been in the same family since it was purchased new in Michigan (theres even great paperwork to show it.) So this coupe has been treated with respect all its life, including a professional re-spray about midway. More than just the history, this has all the elements we love. The widebody appearance is pure aggression the headlights are individually separated; there are large flares for each fender; and the spoiler covers the rear from end-to-end. And everyone loves the attitude that comes from the side scoops and the shaker hood. The camel interior is a great complementing color to the exterior. And since this coupe has only averaged around 1,600 miles annually, it looks refreshingly original right down to the hobnail cloth pattern on the seat inserts. And youll also love how its loaded with features like power windows, power locks, tilt wheel, electric rear defrost, and factory AM/FM stereo. Even the factory air conditioning is blowing nice and cold. The driver gets to face iconic components like the Trans Ams special three-spoke steering wheel, cool machined aluminum dash, and full gauge package with large speedo and tach. The 403 cubic-inch V8 is original to the car, and it has an authentic appearance right down to the decals. And while the shaker hood might only be a display piece on this model year, Pontiac knew it was just too cool not to have on the T/A. The tidy appearance suggests the powerplant has been treated to good regular maintenance, and the way it fires up easily reinforces this careful life. The motor makes great muscle car sounds out of the dual exhaust, and it moves the car with authority. Plus, this one has long-haul comfort thanks to a TH350 three-speed automatic transmission, cruise control, and power steering. Finishing off this driver-friendly package are power brakes w/discs up front and sway bars front & rear. You get all the right documentation with the sale, including the factory buildsheet, dealer invoice, original warranty card, owners manual, and maintenance records. This is a rare opportunity to get a one of the coolest classics around that was also treated like a member of the family. Dont miss your chance, call today!